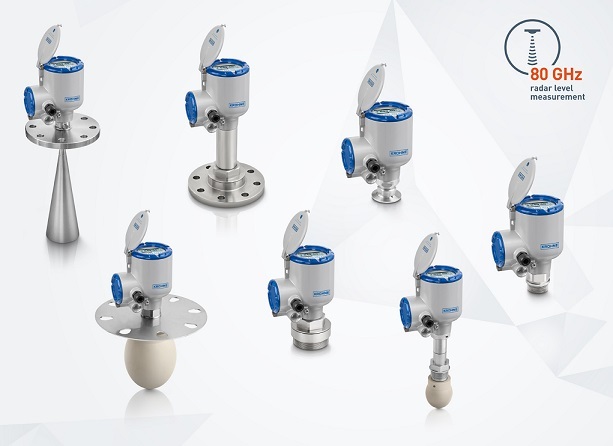 Krohne Optiwave series of frequency-modulated continuous-wave radar level transmitters. Krohne Inc. announces six new 24 and 80 GHz transmitters for its Optiwave series of frequency-modulated continuous-wave (FMCW) radar level transmitters. Each device has a particular application target area, including narrow tanks with internal obstructions, or powders and dusty atmospheres. All of the devices feature two-wire 4…20mA HART 7 communication and come with a choice of process connections, starting from ¾-in. They feature a large backlit LCD display with a four-button keypad, a quick setup assistant for easy commissioning, and free PACTware device type manager (DTM) with full functionality. Hazardous area approvals are available, while others, including safety integrity level (SIL), are in process. New devices for solids include the Optiwave 6400, a 24 GHz FMCW radar for solids from granulates to rocks in industries such as minerals and mining, chemical, agriculture, or power generation; and Optiwave 6500, a 80 GHz FMCW radar for powders and dusty atmospheres, equipped with features that meet the challenges linked to fine powders such as dust, low-reflective media, build-up, and uneven surfaces.